The distribution of matter across the cosmos is most easily explained by inflation, a theory that suggests our universe inflated rapidly — just like a balloon — shortly after its birth, according to new research. 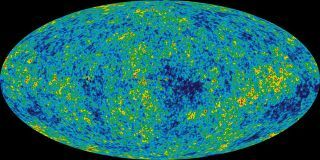 A new study found that cosmic inflation, which was first proposed in 1980, is the simplest explanation that fits the measurements of the distribution of matter throughout the universe made by NASA's Wilkinson Microwave Anisotropy Probe (WMAP), a spacecraft that scans radiation left over from the Big Bang. According to inflation, the universe expanded by a factor of at least 1078 (that's 10 with 78 zeroes after it), all in less than a second. This stage could have formed the basis for the large-scale structure we can detect in the distribution of galaxies around us now. This theory can explain why the universe appears to be about 13.7 billion years old, and why it seems to be nearly flat, say University at Buffalo physicists Ghazal Geshnizjani, Will Kinney and Azadeh Moradinezhad Dizgah. The researchers recently analyzed the latest measurements offering a hint at what went on in the early universe, and found that only three kinds of theories can account for WMAP's observations. "The takeaway result here is that this idea of inflation turns out to be the only way to do it within the context of standard physics," Kinney said in a statement. "I think in many ways it puts the idea of inflation on a much stronger footing, because the available alternatives have problems, or weirdnesses, with them." For example, alternative explanations must invoke either a speed of sound faster than the speed of light, or energies so high that exotic quantum gravity theories such as string theory would be needed to describe them. "It may well be that you can come up with a speed of sound faster than the speed of light, but I think people, as a general rule, would be more comfortable with something that doesn't involve super-luminal propagation," Kinney said. "Inflation doesn't require any exotic physics. It's just standard particle physics." Inflation theory still involves a few mind-bending ideas of its own, though. For instance, inflation suggests that during the first 10 to the minus 34 seconds (that's 0.0000000000000000000000000000000001 seconds), the universe doubled its size at least 90 times. This would have allowed pairs of matter and antimatter particles to appear out of nothingness, but then move apart from each other so quickly that they wouldn't have had time to meet and annihilate, as matter and antimatter usually do. Tiny irregularities in the spread of energy throughout the early universe would have magnified to eventually produce the denser pockets of mass in some areas that allowed gas to condense into stars, forming the galaxies and galaxy clusters that we see today. The research was first detailed in the November 2011 edition of the Journal of Cosmology and Astroparticle Physics in November 2011 and announced in a public release today (Feb. 27).